The Path of Sincerity does not suggest treating yourself like a child. If you are in the grocery store and you want a candy bar, then put a candy bar in your shopping cart. Unless you are about to do something outrageous, it’s best not to restrain yourself. 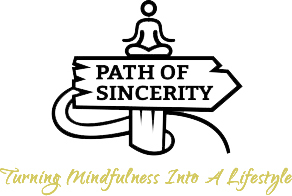 The way to work with desire on The Path of Sincerity is to cultivate enough self-awareness to know what you truly want. Yes, there may be a superficial impulse to grab a candy bar, but there’s probably also a deep inner yearning to live healthily and prudently, only consuming what is necessary. When present moment awareness is strong, there is a felt sense of the impulse to grab the candy, but there is also a felt sense of the deep inner yearning. Early on, even after checking in, it might seem as if you do actually want that candy bar—then grab it! Just keep observing what you do and how you feel on those deeper levels. When you grab that candy bar, do you feel any inner dissonance (or resonance!)? How about after you eat it? Totally at peace? And how about when you abstain from grabbing the candy bar? Just keep up with that for a few years and you might suddenly realize that your sense of what you truly want is quite different than what it used to be. Gentle self-inquiry goes a long way. How do you feel about how you have spent the past hour? What does that tell you about how you’d like to spend the next 10 minutes?